The PP 600 Primer is used for pretreatment of floor surfaces prior to application of Combimix all self-leveling products. The primer has high alkali resistance and ensures good bonding between the substrate and the levelling layer. The primer creates a film that reduces the formation of pinholes in the levelling layer. The substrate should be clean and free of dust, cement skin, grease and other impurities that may prevent adhesion. In terms of the primer forming a film, the temperature of the substrate must not fall below 10 °C. For best results, the ambient temperature in the work area should be between 10 and 25 °C. The relative humidity (RH) in the work area should be under 80 %. PP 600 Primer shall be diluted with clean water in a mixing vessel. For correct ratio, read the mixing guide. The dilution of water and primer is easily mixed by stirring. Always ensure good ventilation while priming the substrate, since it promotes drying. The primer solution should be distributed evenly over the floor surface and then brushed into the substrate with a soft brush. Avoid puddling of primer. When installing the SLC in two layers, every layer must be primed. Absorbent surfaces should be primed two times. The first priming should be diluted 1:5 and the second 1:3. First priming do not need to dry before the second priming is performed. On concrete surfaces it is normally sufficient with one priming, and the primer should be diluted 1:3. On a surface that is not absorbent should the priming be diluted 1:1 + pour dry SLC powder on to the substrate and brush out as thin as possible without leaving any thick buildups. 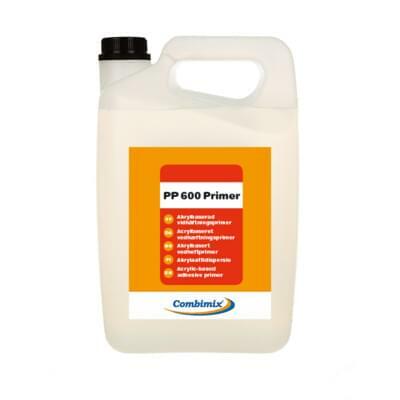 Note that dried PP 600 Primer is very difficult to remove and any spills should immediately be cleaned up with water. Tools and equipment can be cleaned with water. Always make sure that the PP 600 Primer is sufficiently dry before installing the floor covering. The SLC must be applied within 72 hours.